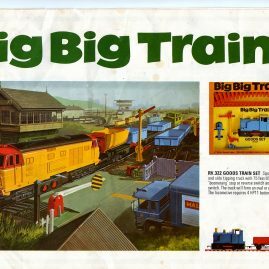 Several catalogues, leaflets and of course adverts were made to support the sales of Big Big Train. Also service sheets were issued for maintenance or repair. Of course the sets and also models sold separately contained instruction sheets. Detailed instructions about the accessories can be found here. The picture below links to the documents photo gallery to show some of the documents that are in my collection.